Complete the Harley-Davidson® Riding Academy Course or other approved accredited course and get rates as low as 2.99%* APR on new motorcycles. You must apply within 180 days of course completion. 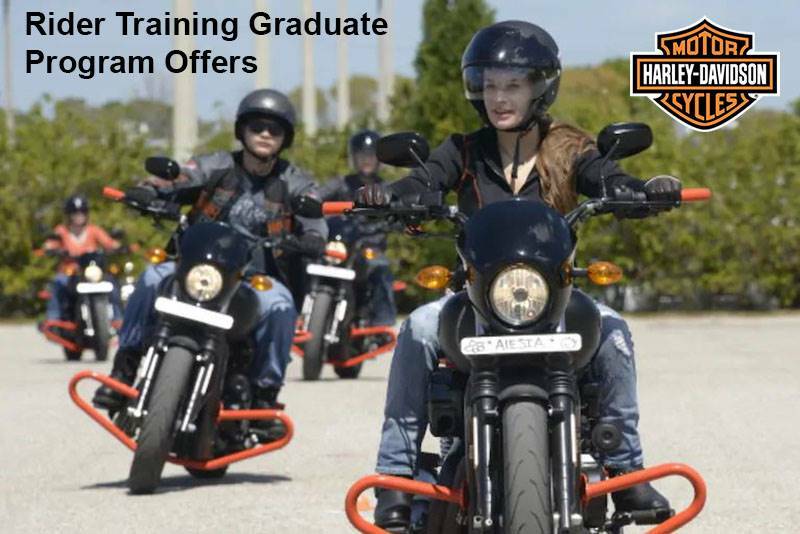 Complete the Harley-Davidson® Riding Academy Course or other approved accredited course and get rates as low as 3.99%** APR on used motorcycles. You must apply within 180 days of course completion. *Financing Offer available only on new Harley-Davidson® motorcycles financed through Eaglemark Savings Bank (ESB) and is subject to credit approval. Not all applicants will qualify. 3.49% APR offer is available only to high credit tier customers who have completed Riding Academy or other MSF accredited course within 180 days of application date and only for up to a 60 month term. The APR may vary based on the applicant’s past credit performance and the term of the loan. For example, a 2019 Softail Slim® model in Vivid Black with an MSRP of $15,949, 10% down payment and amount financed of $14,354.10, 60 month repayment term, and 3.49% APR results in monthly payments of $261.06. In this example, customer is responsible for applicable taxes, title, licensing fees and any other fees or charges at the time of sale. APR is calculated according to the simple interest method. Not valid in conjunction with other offers. Other terms, conditions, and limitations may apply. Dealer participation may vary. Financing offer is subject to change or cancellation at any time. Offer expires June 30, 2019. See your Harley-Davidson® Dealership for details. **Used Financing Offer available only on used Harley-Davidson® motorcycles financed through Eaglemark Savings Bank (ESB) and is subject to credit approval. Not all applicants will qualify. 4.49% APR offer is available only to high credit tier customers who have completed a Riding Academy, Skilled Riders, MSF or other state accredited course within 180 days of application date and only for up to a 60 month term. The APR may vary based on the applicant’s past credit performance and the term of the loan. For example, a 2015 Softail® Deluxe model in Vivid Black with sale price of $18,099, 10% down payment and amount financed of $16,289.10, 60 month repayment term, and 4.49% APR results in monthly payments of $303.60. In this example, customer is responsible for applicable taxes, title, licensing fees and any other fees or charges at the time of sale. APR is calculated according to the simple interest method. Not valid in conjunction with other offers. Other terms, conditions, and limitations may apply. Dealer participation may vary. Financing offer is subject to change or cancellation at any time. Offer expires June 30, 2019. See your Harley-Davidson® Dealership for details.